Poachers killed an adult rhino and escaped with its horn from the Western Range of the Kaziranga National Park, a forest official confirmed the report. The incident took place in Biswanath within hours of Assam Governor Jagdish Mukhi directing law enforcing agencies to take all measures to prevent cases of poaching of rhinos in Kaziranga National Park. The incident happened at around midnight at Polokata near Sitamari area — a sandbar island in the Brahmaputra — south of Baghmari powergrid station under Lahorijan forest camp. “Poachers took its horn and fled the spot, which is an open area of about 200 metres from the forest camp. forest officials found five rounds of empty cartridges of .303 rifle from the spot. Meanwhile a joint team of forest and police personnel launched an operation to nab the poachers. This is the second rhino poaching incident in Kaziranga this year. On January 14, a female rhino was killed at Daflang camp area of Bagori range, but the poachers could not take its horn. 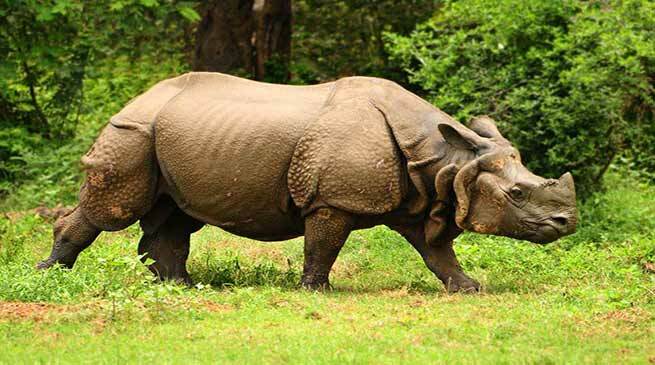 During the ongoing Budget Session in Assam Assembly, Forest Minister Pramila Rani Brahma has said that altogether 74 rhinos were killed by poachers in Assam since 2015 and 316 poachers were arrested during 2015-17. As many as 21 rhinos were killed in 2015, 22 the next year and 9 in 2017, the minister had informed the House on February 8.